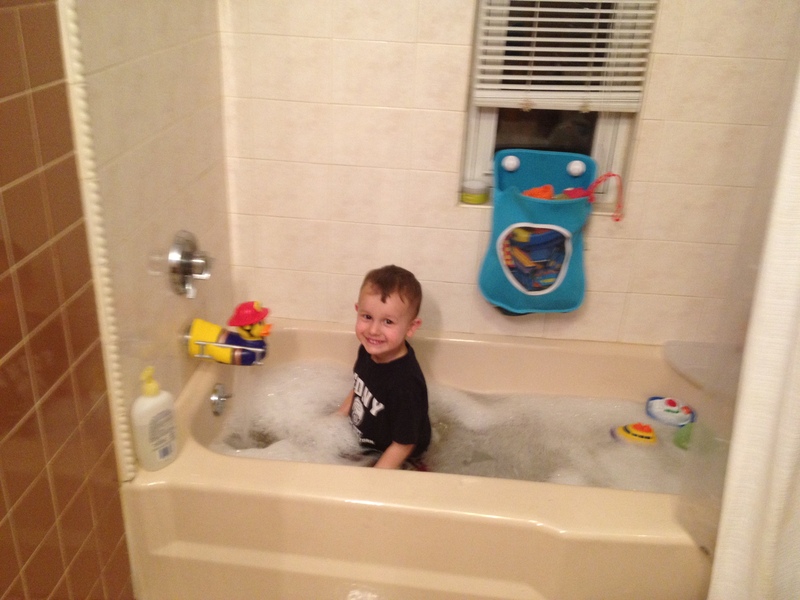 For the past few months, bath time has been a battle of near epic proportions. I say it’s bath time. Robbie tells me he doesn’t want it. 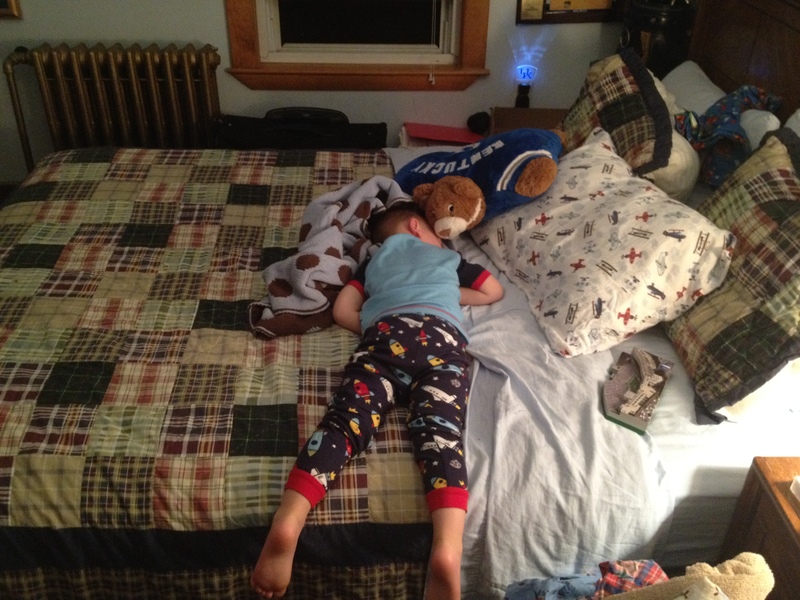 Some nights, he approaches a full-on tantrum. And washing his hair and face? Forget about it. Justin and I do the best we can to throw some water and soap on his head, get a few good scrubs in, and throw some more water over him with only minimal tears – on anyone’s part. All of a sudden, I hear little feet move away from me and tear down the hall. There was laughter, and I braced myself, waiting for him to stop. The next thing I heard was a splash. Running at break-neck speed, I got to the bathroom too late. My child, in the tub. With all of his clothes on (fortunately, I had taken off his shoes). And there was nothing I could really do except laugh. After all, he’s probably only going to go flying into the tub with his clothes on once, right? The very next night, Justin ran bath water and came in to tell Robbie that it was almost bath time before sitting down to check his email. I was reading in the other chair. Then, before we knew it, Robbie was running down the hall. Before we could even react, we heard the telltale splash, looked at each other, and groaned. And then realized that he still had his shoes on. 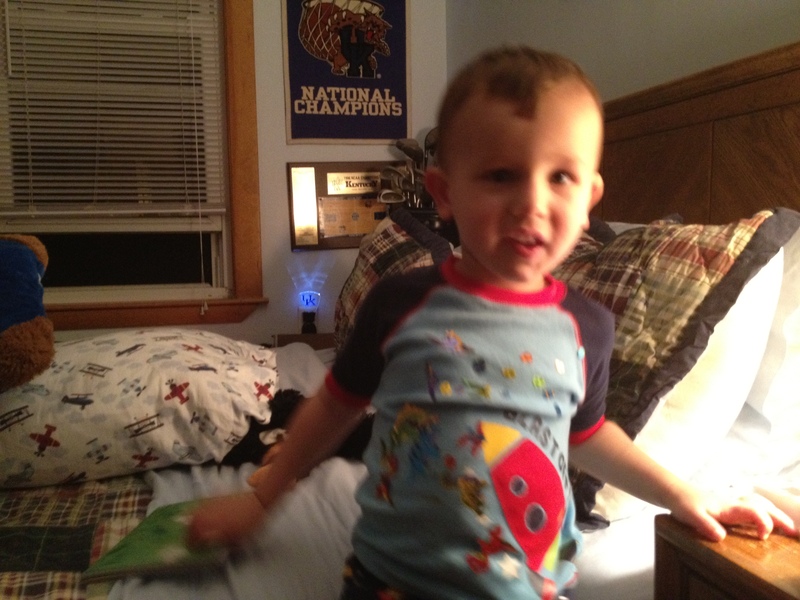 The first few days in the big boy bed provided ample blogging material. However, by the time I finished dealing with each of the adventures, I was too exhausted to write about it. In fact, even now, I’ve been interrupted by a young boy throwing foam Christmas tree cutouts downstairs. When I went up to investigate, I found him standing in the hall with his railroad train pajamas pulled up to his knee, a firetruck winter hat on his head, some sort of sticky frosting on his mouth (still can’t figure that one out; he tells me it was hot chocolate), and a rolled up poster on his hand because he was a pirate. And this is tame compared to the first week in a big boy bed. Take, for example, the night the radio in Justin’s room came on suddenly at 9:00. When Justin went to investigate, he discovered Robbie “playing Daddy” in the office. Justin promptly returned our little CEO to the bed and we didn’t hear another word from him. Until I went to bed. As I got closer to the top of the stairs, I heard giggling. When I got to the third floor, I learned why. There he was, lying on the bed in Justin’s office, amid the laundry and his two pillows, pretending to be asleep. And then, the next night… He was in bed reading his books when I went to bed at 9:30. I didn’t hear a word from him. And then, at 2:30 in the morning, I nearly stepped on him as I walked down the hall to go to the bathroom. 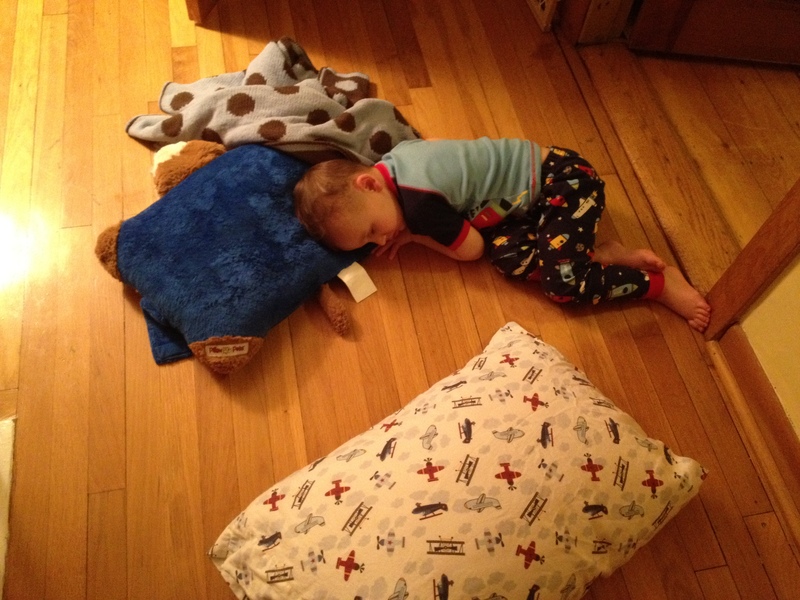 He had, for some reason, brought both of his pillows and his trusty blanket out to the hall and set up camp. I’m not sure if he was worried about missing something awesome or if he thought the floor would provide more support than his mattress. It was just a matter of time. In fact, we’re lucky we lasted as long as we did. Tonight, I converted the crib to a big boy bed. When I was done, all I could do was look at it and cry. It was such a big moment for me. The last vestiges of Robbie’s babyhood are quickly disappearing. Well, except for the diapers. I can’t quite get him to shake those. It wasn’t a big moment for anyone else in the house though. Robbie is unimpressed, a little concerned about his broken bed and, unfortunately, screaming to get out of his room. Yes, I finally gated him in. After two hours of trying to get him to sleep, I resorted to physically blocking the door. It’s all just a little too much freedom for him; Robbie seems to think this is license to just hang out all night. Justin, comforting me in the way only a man can, said, “Well, he’s growing up. He’s a big boy now.” And then he headed back down to watch basketball. So I was left to, for the first time, sit on my son’s bed. I cried a little. Robbie has been becoming a big boy for a while now, and it’s usually in the little ways that show up over time. Getting his own juice. Picking out his own clothes. Telling me he needs to brush his teeth and get his hair cut. Asking to hold my hand when we walk down the street. But tonight it was obvious. And it broke my heart. Robbie talks about running all the time. He loves it, especially when I’m running late in the morning and just need him to get into the car. So, of course, he would love a little family run. Right? No. Last week, I wrangled up Justin and Robbie for our first ever family fun run. Robbie put on his gym pants and found the perfect running shirt (bright yellow, with “shockers” and a yellow jacket on the front; you know, classy). And then refused to even walk to the park. He had to be carried the entire way. When we got there, Robbie got into the spirit and took off around the pond. He ran, pointing out the way he wanted us to go. Eventually, we found our way up a pretty steep trail, which required the cherub to slow down for a few minutes. As soon as he made his way to the top, he was off again, looking for new trails and hills to run down. Robbie ran about a mile and a half that day, which was pretty impressive for a two-and-a-half year old. Given that it was 73 degrees this afternoon, I figured that he and I would have a fun little run to the park again today. We spent twenty minutes finding the right running clothes. He settled on some too-small gym pants but refused to wear anything other than his shockers t-shirt; we eventually found it in the dryer. 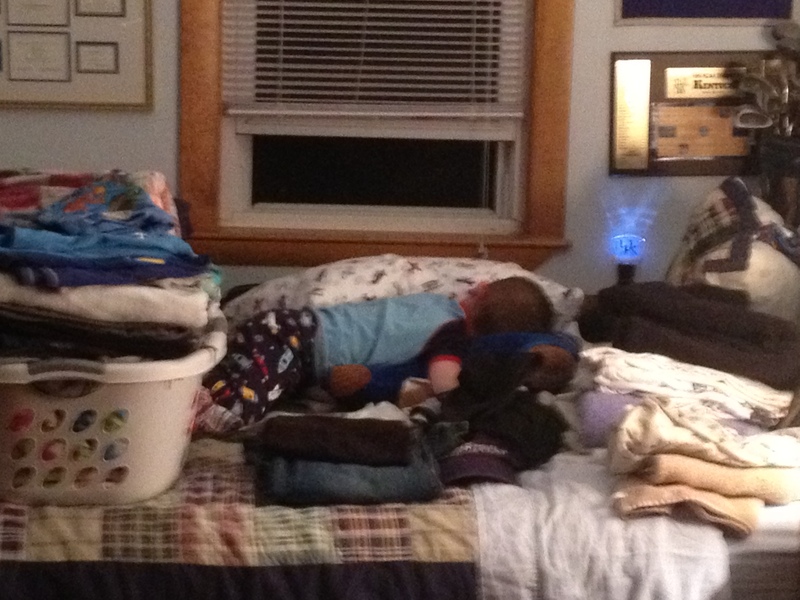 I didn’t want to believe our babysitter, Elena, last night when she told me Robbie had climbed out of his crib. In fact, I laughed. Surely Robbie wouldn’t have climbed out of his crib. Maybe he acted like he would. But he would never actually do it. Boy, did he… Three or four more times. I finally convinced him to play in his room, which he did for about thirty minutes. Afterwards, he came downstairs to cuddle with me. It was kind of nice, just hanging out on the couch. He brought me a blanket and curled up next to me, giving me a sly little smile like we were in on a secret together. Tonight, he’s been in bed for fifteen minutes, and I haven’t seen him yet. I’m cautiously optimistic, but I might not mind hearing those little feet on the floor so much. I’ve known Geneva since before I can remember – at least thirty years. And today, she passed away. I am happy for her; she was nearly 105 years old, much longer than I have any desire to live. But I am sad for me; all night visions have been dancing through my head. Running down the block to get to Geneva’s house. Sitting on the porch, drinking lemonade. Putting on a circus in her backyard. Peering through her basement windows, wondering what was in the mysterious cavern. Venturing into the attic to retrieve something Geneva needed, wishing for time to go through all the treasures that surely existed. Eating the soft peppermints with Christmas trees painted on them. Flipping throughNational Geographic. Wishing her cat, Kitty, would come out and play instead of hissing as she fled the room. Later, in college, I would ride my bike to her house once a week to do light cleaning, go to the grocery, and stop by the bank. It was then that I got to spend more time with her, not competing with my brother and sister for time and attention. Then that I got to know who she really was. Never one to mince words, Geneva also let me know when I had put on too much weight. And, later, when I lost most of it, she refused to believe that I was myself, telling me, “Erin is too fat to be you.” Not mean. Just honest and observant. One of my favorite (and I hesitate to call it this) memories happened in recent years. I stopped by to visit, and Geneva was resting in her bed. She wanted to move to her armchair and asked me for help. I figured it wouldn’t be a problem, so I helped her get to the chair. Just as she got there and started to sit, Robbie started to cry. I turned my attention to him and, when I turned around, saw that Geneva had missed the chair. Instead of sitting on the chair, she was sliding down it, dangerously close to the floor. I had my arms under her and was unable to move myself. I knew I couldn’t get her back into the chair. I knew I couldn’t just leave her there to go for help. And I also knew I was probably going to get yelled at for dropping a 103-year-old woman on the floor. Eventually, I fled to the nurses’ station and told them that Geneva was on the floor. That was all it took for them to spring into action. In a matter of moments, Geneva (unharmed) was off the floor and back in her chair. Every time I visited, though, she asked me to please just leave her where she was sitting. I will miss my friend and our visits. But, for her sake, I am glad that she was able to go peacefully. She told me well over a decade ago that she had stopped reading the obituaries because everyone she knew was already dead. I’m just glad she can finally be with them again. I know it’s shocking. I am not cut out to be a stage mom. Sure, the idea of trying on clothes and having your child’s picture taken sounds fabulous. And maybe, if it takes an hour, it is. Unfortunately, ours is a story of a different sort. We had the opportunity to look into modeling with Robbie and today was the photo shoot for his composite card, which was scheduled for 3:00. By 4:18, we had scheduled a follow-up appointment, had our outfits selected, dressed the child (who was actually cooperative), had his hair done, and waited for ten minutes. He got through the first of four shoots without incident. Robbie was charming; throwing the ball, climbing on boxes, laughing. I thought, Maybe this could actually work. And then we hit the second shoot. Robbie did not want to sit still. He did not want to face the camera. The only thing he wanted to do was push boxes toward the photographer. I could tell the man was getting irritated, but my big clue was when Robbie came around to see the pictures and said, “Too cute!”, which is, I think, what Zhining tells the kids. The man looked at Robbie and said, “You think that’s too cute? It’s not too cute. I can’t use any of these! I wish you could just sit still.” Of course, it was said in a French accent, dripping with irritation. And so we took Robbie for a few minutes to play and have some juice and a snack while the man re-centered himself (and we continued with a different photographer). Robbie loved having his hair done, calling it a hair cut and, eventually, climbing into the chair by himself to get “tickled” with hair spray. He thought it was a great game to run around the studios, climbing up and down the blocks, and generally acting like a mad man. The photographers kept asking if he would ever get tired. The answer, unfortunately, was no. Robbie does not get tired until he is in his carseat on the way home. We have waited for this moment for months, but I wasn’t sure we would ever actually do it. After all, moving a thousand miles is a big deal. So is all that it entails – selling a house, buying a house, finding a job. Leaving friends who have become family. Explaining to Robbie that while he won’t see his best friends anymore, he’ll get to see Nona, Pops, and Aunt Halaree and even make new friends. I’m a little terrified, though, that he’ll forget the people who were so instrumental in the first three (how has it been three?!) years of his life. And so here we are. Hoping to find the perfect buyer, sooner rather than later. Reminding ourselves that this is the right move, even though it will be so hard to leave our little treehouse. Our first real home, where I struggled navigating stairs in the middle of the night when I was nine months pregnant. Where taking laundry to the basement is a hazardous occupation. Where Robbie learned to crawl, say his first words, and walk. It is a house that, when we have one, our second child will never know. But it will be fine; we will be fine. After all, without any ‘ventures, what would there be to look forward to? I’m not sure where this kid got his sense of humor, but he is the funniest person he knows. This morning, when I woke Robbie up to get ready for school, he refused to open his eyes. While I was getting him dressed, he laid on the changing table with his eyes closed and a huge grin on his face. “Are you asleep?” I asked. “Nope!” he exclaimed, shaking his head. “Are you awake?” I continued. Then, while we were putting on his clothes, he informed me that he would like to go see sharks with Aunt Barb. This is actually not too strange, given that we did go see sharks with Aunt Barb last week. However, he later told me that he wanted to get on Aunt Barb’s boat and go see sharks. Unfortunately, her boat is on a lake and not the ocean. But I didn’t want to squash his hopes so early in the day. On the way to school, Robbie was pretty quiet. Then, all of a sudden, I heard a loud, “Shark! Ooo-ha-ha!” I tried to explain that the line (from Finding Nemo, for those of you fortunate enough not to have watched in 972 times in the past week) was, “Shark Bait! Ooo-ha-ha!” He still doesn’t believe me. Of course, his best quote from the day was after we got rear ended on Mass Ave. in Lexington. The car in front of me stopped for a pedestrian. I stopped behind it – just barely. My brakes locked up, and I was inches from the bumper. The car behind me tried to stop; I could hear the brakes locking. And then I felt the impact. Well, heard it more really. I’m almost embarrassed to tell you what I said. It didn’t even occur to me that there was a child in the car. It was some blasphemous form of “damn it!” And then, from the back seat, I heard my little parrot repeating me with enough passion for me to believe that he, too, was really irritated by the fact that our car had been hit for a second time from behind. I wondered how long it would take, reaching the gimme stage. Two years, seven months, and one day. I picked Robbie up at daycare this afternoon, and he was in dire need of an apple. His third of the day. That was when I heard it for the first time. “Gimme apple, ‘Neanne.” Not even a please crossed his lips.